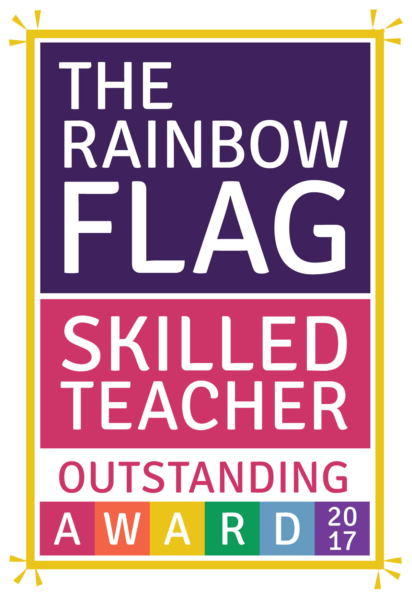 We are delighted to have been awarded the ‘Outstanding Skilled Teacher’ award of the Rainbow Flag Award, which encourages schools to become more LGBT inclusive and help eradicate homo/bi/transphobic bullying through education. Our school submitted evidence that met both the ‘minimum’ and the additional ‘fully’ standards, which was scrutinised against the Rainbow Flag Award prospectus. Our evidence included training staff to effectively cascade knowledge and information to the wider staff team, and demonstrated how change has been implemented as a result. This, along with many other criteria, resulted in us receiving a special ‘outstanding’ version of the Skilled Teacher award. 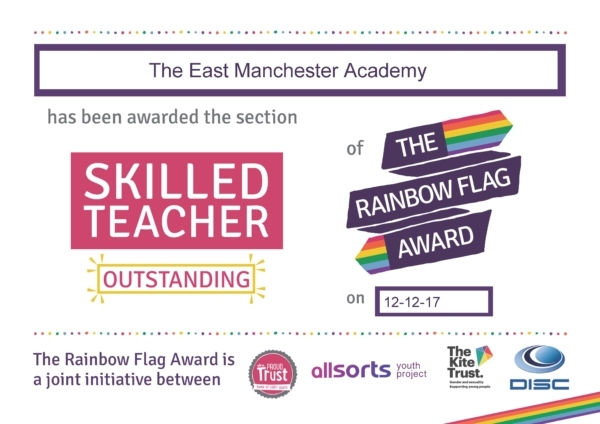 This is a really great start to the Rainbow Flag Award from The East Manchester. There has been some effective training of staff that has led to some really great pledges. Already, very positive changes can be identified by staff, students and, crucially, LGBT students. We are very pleased to fully award in this section to you, you will receive our ‘outstanding’ badge in recognition of what is happening there. We look forward to welcoming back The Proud Trust in March 2018, when we plan to submit further evidence in more areas of the Rainbow Flag Award.